Human-rights groups from Guerrero have warned of the risk of a “famine” in light of the scarcity of food and the abandonment of residents of the indigenous regions of the Mountain and Coast after the passing of the storms which recently devastated the state. Leopoldo Soberanis Hernández, president of the Alliance for Human Rights United Guerrero, and Abel Barrera, director of the Tlachinollan Center for Human Rights, denounced by phone to the Proceso magazine that the Plan DN-III is not being applied in the rural zones of the state, thus aggravating the situation for residents of isolated communities. In the region of the Mountain, thousands of indigenous persons have abandoned at least 48 communities due to hazards and the loss of 80% of the crops that were devastated by the severe rainsfalls brought by tropical storm Manuel, noted Javier Guerrero, subsecretary for Social Development. 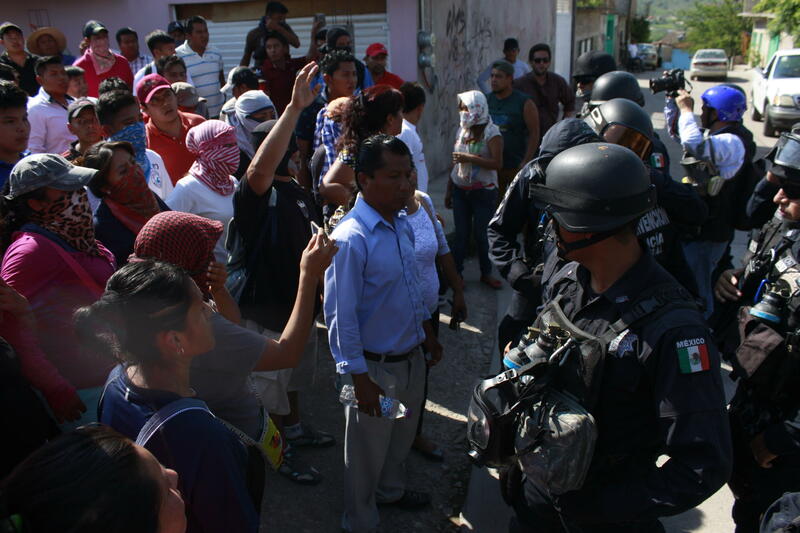 During a meeting carried out in the Catholic House, which has become a shelter of sorts in Tlapa de Comonfort for more than 160 displaced indigenous persons, Guerrero reported that the federal highways Tlapa-Marquelia and Tlapa-Metlatónoc, the two principal routes that connect the poorest municipalities of the country, have been destroyed. 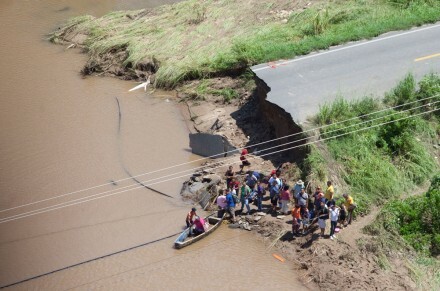 The residents of different communities such as Tilapa and Santa Cruz del Rincón report that the highway has simply disappeared. A 30 September communique from the Tlachinollan Mountain Center for Human Rights mentions that “in accordance with the Secretary for Social Development (SEDESOL), there are 48 communities that continue to lack access by aerial and terrestrial routes, though this statistic could increase considering that in the municipalities of Acatepec, Metlatónoc, and Cochoapa it is practically impossible to maintain constant communication. Attention by means of air is insufficient and the criteria for the definition of routes for helicopters lack transparency.” Of the 700 indigenous communities located in the Mountain region of Guerrero, to date there has been had contact with only about 100, claims Tlachinollan. The official statistics speak of 33 dead, according to the report released on 26 September by Civil Protection, but the testimonies collected by Tlachinollan mention at least 42 dead, without taking into account the disappeared. 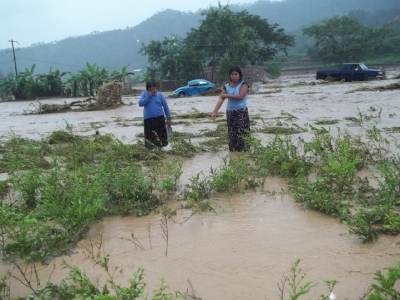 On 23 September, indigenous peoples of the Mountain formed the Council of Authorities Affected by the Storm, which will be the voice of the people. Abel Barrera, director of Tlachinollan, indicates that the members of the Council will insist that they not be excluded from decision-making processes. In his view, what usually happens is that the mayors meet behind closed doors with the Army and State authorities and make decisions behind the backs of the displaced, with the result that aid and resources are mobilized without consulting local residents. Abel Barrera Hernández, director of Tlachinollan, denounced that “when in Mexico the situation of migrants is discussed, these are immediately associated with the oppressive conditions confronted by Central American peoples who transit through Mexico, or even the struggle of our compatriots in United States […]. But the systematic violation of the human rights of the thousands of indigenous families who year after year migrate to the large agricultural camps of the northern states of Mexico to survive oscillates between invisibility and indifference.” It should be mentioned that close to 26% of the Mexican population is migrant and that, of these, 9 of 10 are internal migrants. 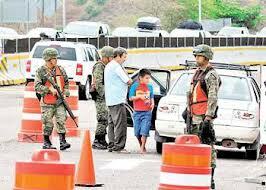 Following the announcement made on 3 January by governor Angel Aguirre Rivero that the Mexican Army would take over Operation Secure Guerrero (OGS), Abel Barrera Hernández, director of the Tlachinollan Mountain Center for Human Rights, criticized that this would mean that a military institution would be in charge of the security of the populace, given the numerous denunciations of human-rights violations committed by soldiers in the past few years, ones “that even have increased in number.” “The decision to leave Operation Secure Guerrero in the hands of the military is a bad sign; the screw is being tightened, and from our perspective, decisions are being taken that do not guarantee peace and tranquility but that rather worsen the situation of the people,” stressed Barrera Hernández. Beyond this, the Tlachinollan director warned that this year “there is seen a sobering panorama for human-rights defenders and social activists”; he furthermore denounced that the state and federal governments have not observed the recommendations made by the National Commission on Human Rights (CNDH) and the Inter-American Court on Human Rights (IACHR) in several cases. In Chilpancingo, on 10 September, the caravan was welcomed with the following banner: “Alive they were taken from us; alive we want them to be.” Abel Barrera, director of Tlachinollan, was in charge of welcoming the Caravan. In this act he spoke of the human-rights violations that the people of Guerrero have suffered, particularly the indigenous population (17% of the total population= which has resisted militarization since the 1970s. For her part, Tita Radilla, daughter of the disappeared Rosendo Radilla, shared the pain associated with the crime of forced disappearance and spoke of the long journey in the search for jutsice, not only for her father but for all other victims of this crime. On 11 September, the caravan passed by the port-city of Acapulco, one of the most important commercial ports and tourist-cities in Mexico. 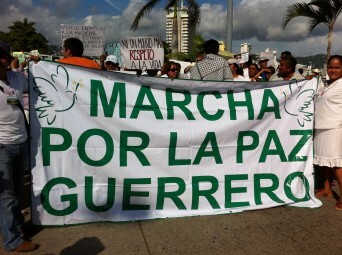 A group of people dressed in white welcomed the Caravan, carrying signs with the faces of relatives and/or friends who have been murdered or disappeared in the waves of violence; youths excluded from education engaged in a hunger-strike; and local organizations attended the mobilization to relate how it is that the social fabric of the port has been destroyed by the advance of violence, whose principal characteristic is always to tend toward impunity. 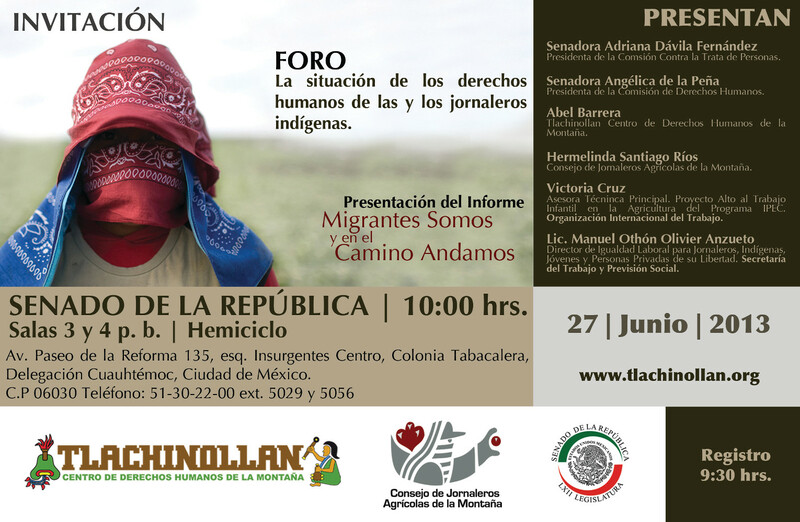 On 1 and 2 July was celebrated in Tlapa de Comonfort in Guerrero’s La Montaña the 17th anniversary of the Tlachinollan Mountain Center for Human Rights, days on which were held a “Forum in Defense of Land,” a subject around which many peoples have been organizing themselves. The forum was attended by nearly 200 individuals from different social and civil organizations from Guerrero, Oaxaca, Chiapas, and other places. 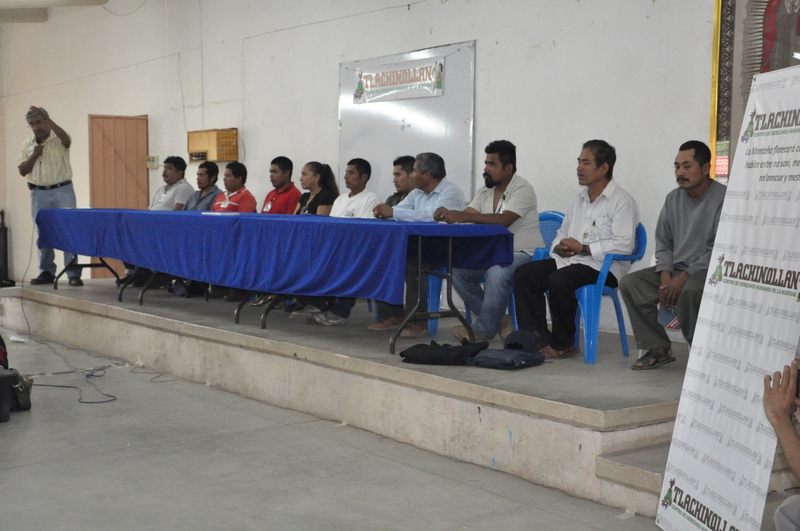 During the first day of the forum were had presentations by activists of different municipalities in Guerrero and Oaxaca who are opposed to mineral exploration and exploitation and the construction of hydroelectric dams in their territories. On the second day, participants met in three work-groups (Defense of Territory, Right to Consultation, and Defense against Dams) where they could share their experiences and seek out ways in which to unite their efforts. A common theme at the forum was the right to consultation. Different speakers emphasized its importance and the fact that several different interpretations of the concept could be had, depending on the party in question and his or her interests in a given project. In spite of the reduced presence of women in the panels on the first day, many participated actively in the plenary sessions and in the work-groups. In the group on Defense against Repression, several women emphasized the importance of women’s participation in struggle. They mentioned that it is often women who lead struggles of resistance against the exploitation of land. The celebration of the 17th anniversary ended with a mass in the Catholic church of Tlapa, celebrated in honor to Tlachinollan, as well as with a festival of presentations of traditional and modern cultures.